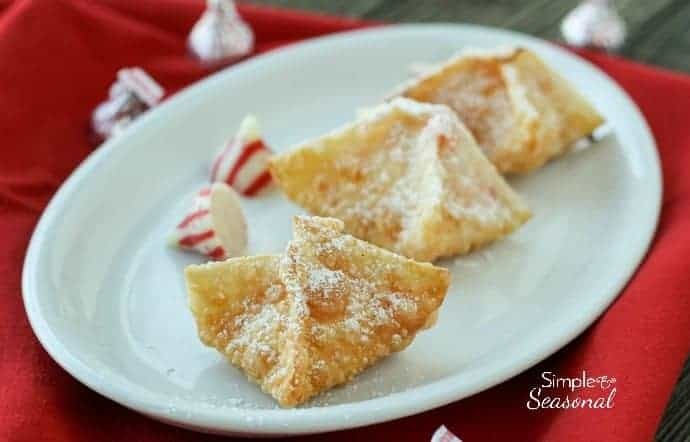 Peppermint Wonton Kisses - Only 4 Ingredients and super easy to make! These cute little Peppermint Wonton Kisses are filled with Hershey’s Kisses candy and only four ingredients. They are a super easy Christmas dessert and perfect for your holiday party or Christmas Cookie Swap! Cookies are my favorite dessert. There are so many different kinds of cookies and they all seem to come out when the holidays come around! I was flipping through an old edition of Taste of Home magazine and came across a page I had dog-eared. It was full of easy Christmas cookie recipes that are perfect for gifts, cookie exchanges or parties. 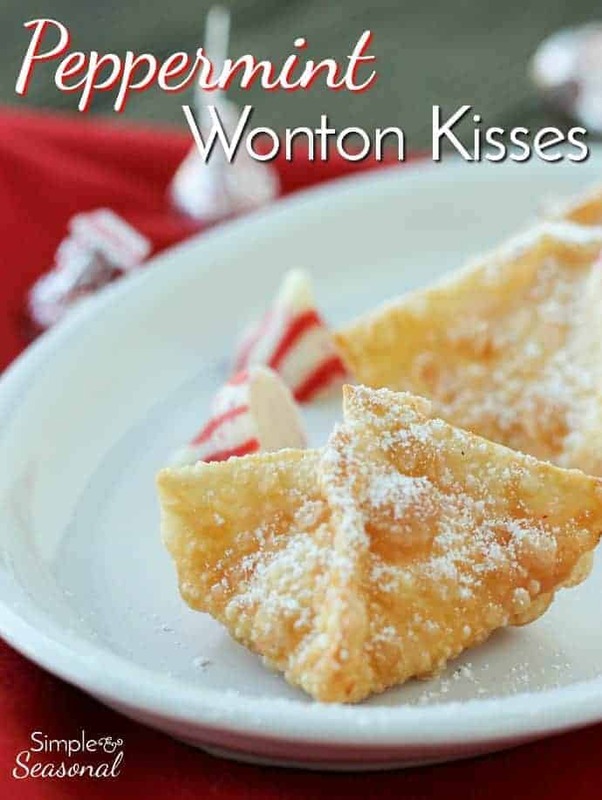 I decided to try the Wonton Kisses for myself, with just a little swap that makes them ideal for the holiday season. Peppermint Wonton Kisses are a fun little package for your party table! Looking for some other great (AND EASY) cookie exchange recipes? Take a look at Princess Pinky Girl’s Easy Snowman Sugar Cookies or her brand new Hot Chocolate Cookie Cups! 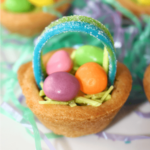 They are super cute and really easy to make! They also make great holiday cooking projects to do with your kids! We like to call them food crafts! Hello again, Princess Pinky readers! I’m Nicole from Simple and Seasonal and I’m back with a fun recipe that’s perfect for the holiday season. You really cannot find an easier recipe for a quick dessert. 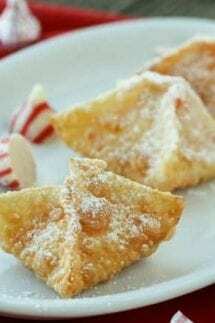 Peppermint Wonton Kisses only have four ingredients, and that’s including the oil it takes to fry them! I think they would be a fun way to finish off family night with Chinese take out. 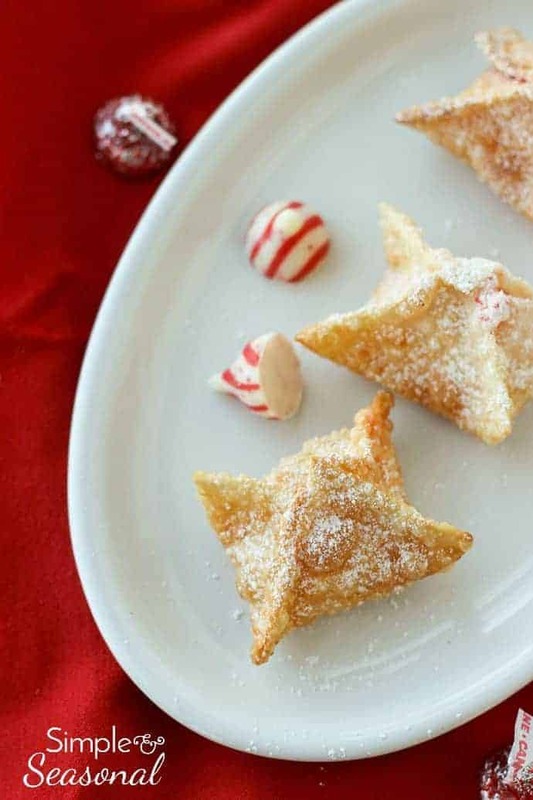 Love this Peppermint Wonton Kisses recipe? Love Peppermint? 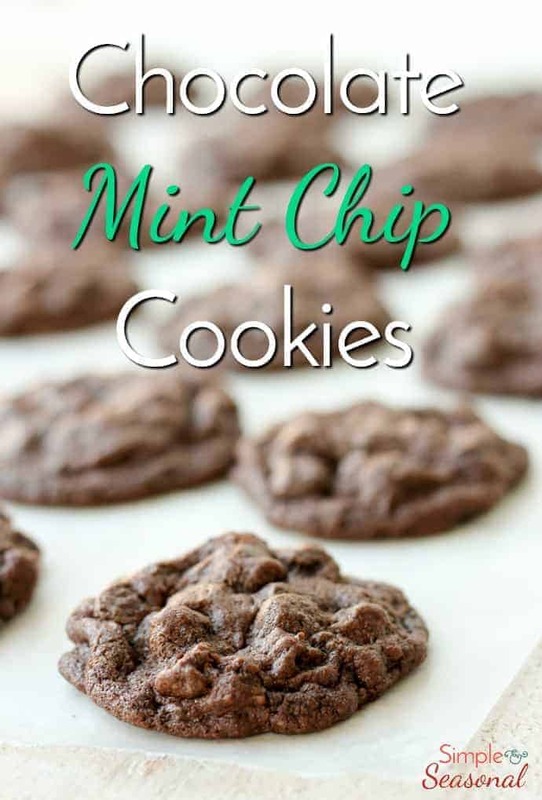 See all of these amazing Peppermint Recipes! These cute little Peppermint Wonton Kisses are filled with Hershey's Kisses candy and only four ingredients. They are a super easy Christmas dessert and perfect for your holiday party or Christmas Cookie Swap! Place a kiss on the center of a wonton wrapper. Moisten the edges with water (I like to keep a small bowl handy to dip my fingers in as I go.) Fold the opposite corners together over the kiss and pinch the seams together to seal. In a skillet or deep fryer, heat 1 inch of oil to 375 degrees. Fry until golden brown (less than 2 minutes) turning once. Drain on paper towels and then dust with powdered sugar. For best results, serve right away. Only fry a few at a time to keep the pan from overcrowding. Be sure the seams are tightly closed so the melting candy stays inside while cooking! These are also delicious filled with other kinds of candy. 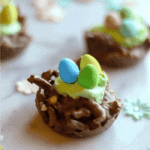 Try milk chocolate kisses or caramel filled for a sweet treat! 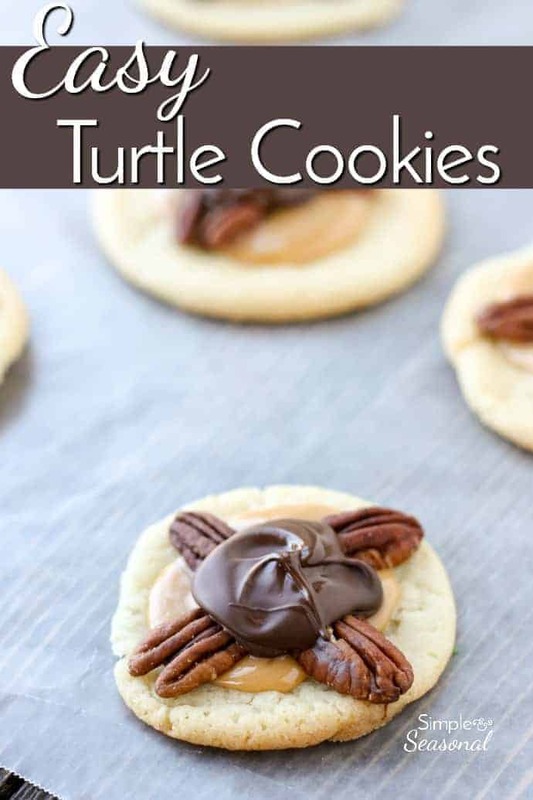 Check out these other cookie recipes from Simple and Seasonal for more ideas this holiday season!